Beatrice Jacqueline Laflamme Schnauber passed away surrounded by her family on Monday, October 22nd, 2018. Bea, originally from Chicopee, Massachusetts, was born February 3, 1937 and married William Schnauber on August 4th, 1956. They then moved to Meadville where they raised their five boys: William Schnauber (Jan Buckley) of Wichita, KS, Robert Schnauber (Karen) of Chicopee, MA, Barry Schnauber (Cindy) of Pittsburgh, Brian Schnauber (Lorna) of Deer Park, TX, and Bradley Schnauber (Lynne) of Meadville. 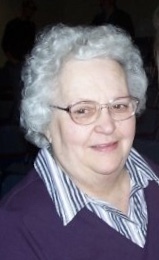 Bea was a cook at Allegheny College for 10 years and had previously worked at various other local restaurants. Outside of spending her time with her family, Bea enjoyed crafting, cooking and playing bingo with her friend Yvonne. Throughout her life, Bea was active in her community and volunteered when needed including as a former Cub Scout Den Mother. After Bill retired from the Meadville Fire Department in 1994, Bea continued to support the department with meals during the holiday season. In addition to her husband and children, she is survived by her grandchildren: Matt (Kristen), Jeremy (Melissa), Becky (Kevin), Robin (Junior), Alisha (Chris), Eric (Ashley), Dani, Jacklyn, Ali, Wesley, Karlie, Brendan, Benjamin, and Emiley; great grandchildren: Jaden, Jaxon, Nolan, Nora, Roman, Gavin, Addison, Brantley, Rori, Mason, Camron, Braylen and baby girl Schnauber; siblings: Claire Laflamme, Mary Jane Wall, Richard Laflamme, Noel Laflamme, Theresa Hortie and Ernest Laflamme, Jr.; and many nieces, nephews, great nieces and great nephews. She was preceded in death by her parents Antoinette Lavoie Laflamme and Ernest Laflamme; siblings, Lillian Laflamme, Norman Laflamme, and Leonard Laflamme; and great granddaughter, Ellie Sanchez. Calling hours will be Wednesday, October 24th from 5-7 p.m. at the ROBERT W. WAID FUNERAL HOME, 581 CHESTNUT ST., MEADVILLE where the funeral service will follow at 7:00 p.m. with Fr. Jeffrey Lucas officiating. Memorials may be made to the Alzheimer’s Assoc., 1600 Peninsula Dr., Suite 15, Erie, PA 16505 or Wesbury United Methodist Community, 31 N. Park Ave., Meadville, PA 16335.